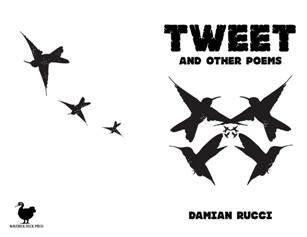 Damian Rucci - "Tweet and other poems"
Damian Rucci is a poet, writer, and internet personality based out of Keyport, New Jersey. He has performed his poetry across the country and his work can be found in dozens of literary journals both in print and digital. He is the author of the chapbook A Symphony of Crows (Indigent Press 2015) and Tweet and Other Poems (Maverick Duck Press 2016). He is the host of the renowned Poetry in the Port reading series and the editor of the Bayshore Review.